For some reason my score didn't go to the leaderboards. Maybe because it is a custom song? Idk. But here is proof I beat you! I'm back to owning all high scores. 1 day and wilkins hasn't taken this back from me? I need competition! Tyler wrote: Source of the post 1 day and wilkins hasn't taken this back from me? I need competition! STFU. You know I wouldn't do that!!! Would no fail scores even show on any screen? I wouldn't know, ive never tried! Maybe next time I log in the score will be synced somehow. I'll just have to beat it again otherwise. Yeah I think it still shows a score in no fail mode. Tyler wrote: Source of the post Maybe next time I log in the score will be synced somehow. Logged on to beat Wilkins again, but my score was there. Thank goodness. Lol I played it four times! Right now I have three of your scores. Beat Saber, the new angels song, and shia labeuf. 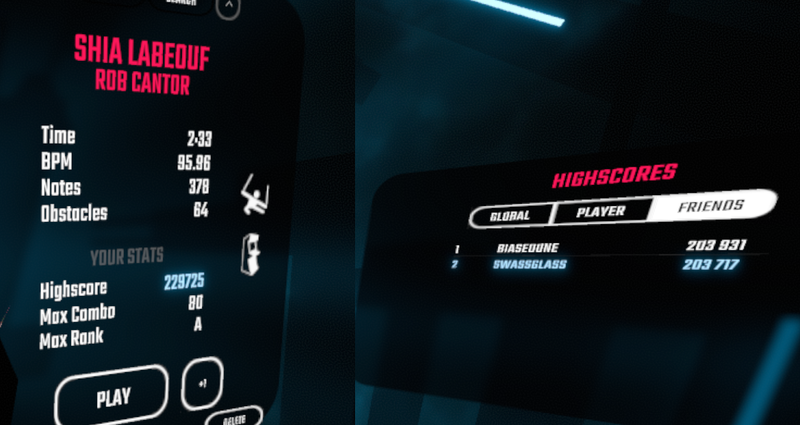 4 times on that song, but you said you played almost 2 hours trying to take any of my high scores. cwilkins88 wrote: Right now I have three of your scores. Beat Saber, the new angels song, and shia labeuf. No one cares about Shia and Angels. You only have 1 that matters. Naw, played almost two hours total, but I spent a good portion on what i've done as well. Played about each of the songs 3-4 times. I care about shia the most! It's the hardest song. I'm proud of you son. I've trained you well. I'm tempted to get on and try to beat a song or two...but I like the idea of not being sweaty and sore. I appreciate you greatly for updating the Google doc. You're good people. Tyler wrote: I'm tempted to get on and try to beat a song or two...but I like the idea of not being sweaty and sore. Thanks brah. I stopped updating the spreadsheet when I was the only one playing competitively. We all know Im not quitting. I'll play Sunday night or next week sometime.